Modding has been a huge part of the Grand Theft Auto games on PC ever since Grand Theft Auto III debuted a then-new 3D engine and a much larger world. Because Rockstar doesn’t provide any kind of formal editing tools, however, the end-user community took it upon themselves to create the necessary software. One of the most popular editing suites used in GTA V was a program called OpenIV, which supported database manipulation and could be used to create a vast range of gameplay changes, effects, and content swaps. 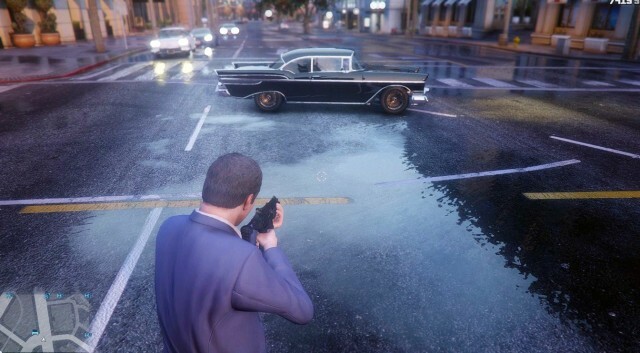 If you’ve ever seen videos of the popular Vehicle Cannon mod, you’ve got some idea of how zany some GTA V modders are (and to be fair, it looks hilarious). This explanation hasn’t set well with many modders, who have noted that OpenIV was strictly a single-player mod system. There’s supposedly no evidence that OpenIV interfered with GTA Online, which hasn’t really seemed to need any help from modders when it comes to being a rampant hellhole of cheats and hacks. Few would argue Take-Two doesn’t have the right to control its games and the modding situation in any way it pleases. But Rockstar has previously been supportive of the modding community, and this C&D clearly pissed off a lot of long-term players. Mod communities tend to keep a game alive and in the public eye much longer than it might otherwise be, and this very much includes GTA V. Not all mods are banned (trainers still work in single player), but OpenIV’s strength was its ability to manage hundreds of mods at once. PCGamer notes that modding fans have taken to Steam to vent their disapproval; only 21 percent of the 23,000 reviews left for GTA V in the past 30 days are positive. OpenIV was also used to produce machinimas based in GTA V, since it allowed for camera controls not implemented in the included game. Mods like LSPDFR, which transform GTA V into a law enforcement simulator, required OpenIV. The software still works if you already downloaded it, but can’t be downloaded anymore.